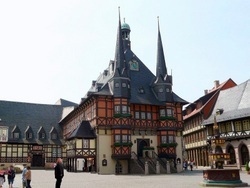 Wernigerode is a most beautiful, mediaeval city in the Harz region and truly a pleasure to see. 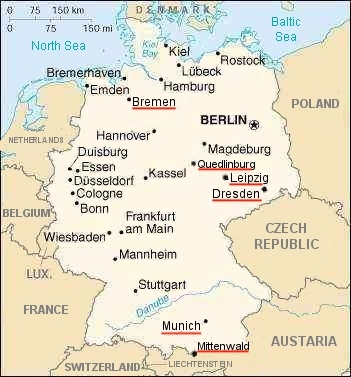 In comparison to Quedlinburg it is more exclusive and colourful. The city is dominated by the 500 years old castle, which is located on the hilltop that rises sharply at the city. The castle was founded in the 12th century. In the 15th and 16th it was extended and fortified by ditches, barriers, walls and gates, which made it an almost impregnable fortification. In the 17th century it was redesigned as a baroque castle but only in the 18th century it became the residence of the counts as castle of representation. It is a museum now with well preserved antique furniture and accessories. 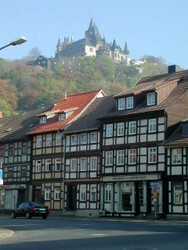 The historic market place is dominated by the famous 500 years Old Town hall. Because of its incomparable beauty it is a preferred place for marriages four young couples from all over the world. Enjoy the flair of this exciting city and don't miss to have a rest in the "Café Vienna", built in 1583 (next to the market place).